St Andrew is the patron saint of Scotland He was one of the Twelve Apostles (disciples of Jesus) and brother of Simon Peter (Saint Peter). He was a fisherman by trade, who lived in Galilee (in present-day Israel). Some of his bones are said to have been brought to what is now St. Andrews in Fife during the 4th century. The Scottish flag is the cross of St. Andrew, also known as the Saltire. It is said to be one of the oldest national flags of any country, dating back at least to the 12th century. The white cross symbolises the cross on which St Andrews died while the blue background represents the sky. 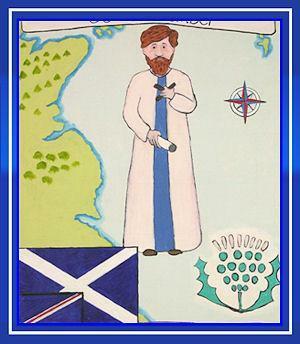 St. Andrew's Day is celebrated on 30 November.